Two of eighteen Allied POWs rescued by USS Queenfish (SS-393). On September 12, USS Sealion II (SS- 315) sank the Rakuyo Maru, a 477-foot Japanese-built passenger-cargo vessel carrying a load of raw rubber and, unknown to the crews of the submarine wolf pack pursuing her convoy, over 1300 Allied prisoners of war. Two of Sealion's torpedoes hit the POW ship, one amidships and one in the bow. It took 12 hours for Rakuyo Maru to sink, which allowed the surviving POWs some time to make rafts and search the doomed ship for food and water. The Japanese guards had left the ship immediately after the attack using most of the lifeboats. Four days later, USS Pampanito (SS-383) found two men on a makeshift raft. Pampanito's log recorded: 1634 Hours - "The men were covered with oil and filth and we could not make them out.... They were shouting but we couldn't understand what they were saying, except made out words 'Pick us up please.' Called rescue party on deck and took them off the raft. 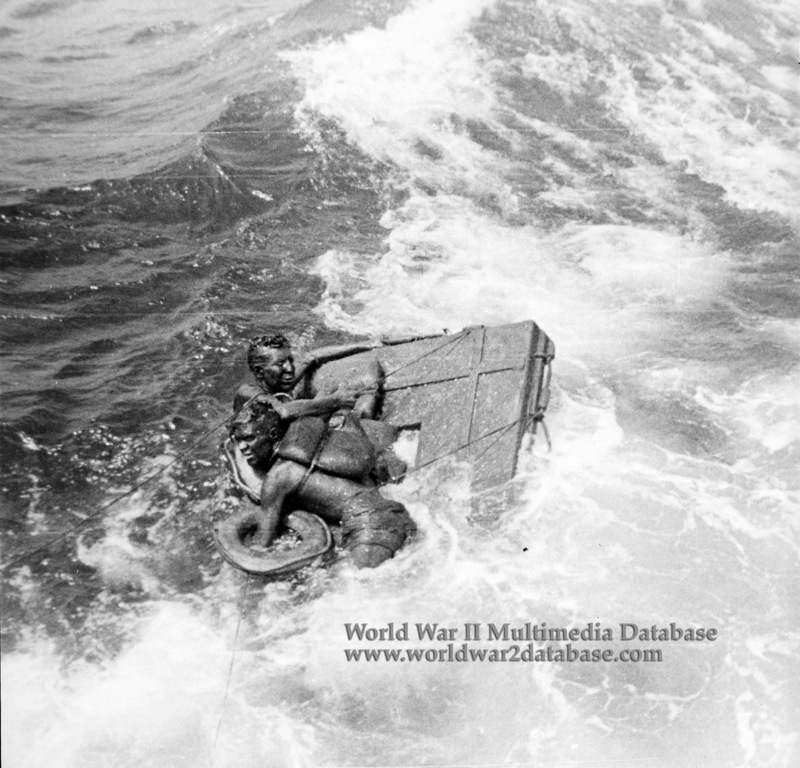 There were about fifteen (15) British and Australian Prisoner of War survivors on this raft from a ship sunk the night of September 11-12 1944. We learned they were enroute from Singapore to Formosa and that there were over thirteen hundred on the sunken ship." Pampanito rescued as many as she could and radioed for help. Queenfish and USS Barb (SS-220) arrived at 0530 Hours on September 17th to begin their search for rafts among the floating debris. Just after 1300 they located several rafts and began to pick up the few men still alive. They only had a few hours to search before a typhoon moved in, sealing the fate of those survivors not picked up in time. Before the storm hit, Queenfish found 18 men, and Barb found 14. The boats headed on to Saipan after a final search following the storm revealed no further survivors. Of the 1,318 POWs on the Rakuyo Maru sunk by Sealion, 159 had been rescued by the four submarines: 73 on Pampanito, 54 on Sealion, and the 32 found by Queenfish and Barb. It was later learned that the Japanese had rescued 136 for a total of 295 survivors.